Before we get into that, let’s get clear on the role reporting plays in your overall marketing strategy. Monthly, weekly and daily digital marketing reports are essential for setting and tracking performance goals, including website traffic, conversion rate, and lead generation. You need to know where you are at and where you are going to avoid wasting time and energy on marketing strategies that simply don’t work. That’s exactly what your reporting process is there to help you do - unless it wastes more resources than it saves. The amount of marketing data a mid-sized eCommerce company generates can become overwhelming, even for the best marketing professionals - especially if you only review the data once a month. However, with automated reporting software like conDati, the days of pouring through complicated spreadsheets to find the numbers you’re looking for is over - it’s all right there in front of you. Plus, it's a snap to review your data weekly, daily or even hourly to stay up to date on your progress and avoid an overwhelming amount of work at the end of the month. In order to use the resources at your disposal effectively, your marketing reports should always zero in on the company’s main digital marketing goals. That’s not always easy to do with manual reporting, as it's time-consuming and complicated to provide proper context for the data in your report. 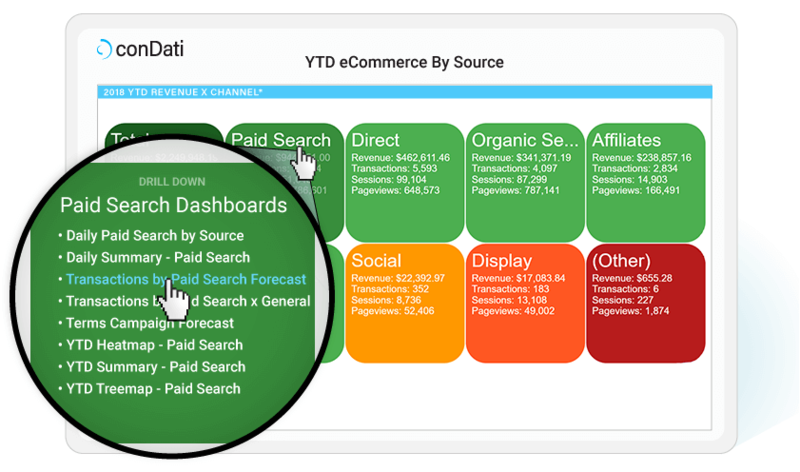 conDati's built-in library of dashboards track and measure the exact KPIs you want, and allow you to easily present them in relation to the company’s growth goals. Let’s say you’ve got a great marketing idea in mind, and you want to present it to everyone at the next marketing meeting. Before the introduction of automated reporting software, you would have to go through the manual reporting process to put together an up-to-date report with all the relevant KPIs in it. But with conDati, it's easy to share dashboards with the exact KPIs to present your case and deliver instant comprehension to your audience. In addition, conDati's interactive boardroom quality visualizations will instantly increase the professionalism of your presentations - and your CEO will certainly appreciate it. 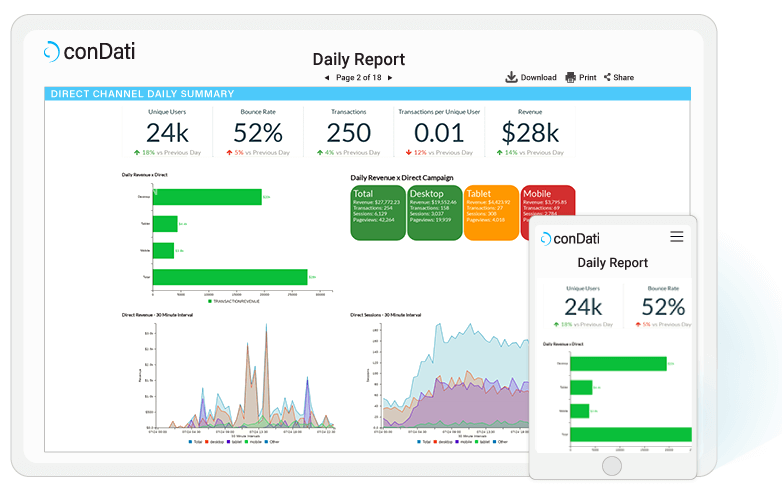 conDati is all about simplifying your reporting process to help you improve the performance of your digital marketing strategies. Looking to leave the spreadsheet hell behind you? Get a free demo now.